Sunday is usually Farmers Market Day for us. It’s a lazy day; we wake up late, stroll down the street where the farmers market is, and take our time browsing and sampling through the various stalls. We usually don’t buy much, maybe some fruit and healthy snacks, or some flowers. Sometimes we have brunch, sometimes we go to the park or a garden nearby for a walk. You know those kind of days. It’s the kind of day that calls for comfy clothes, clothes you don’t mind falling asleep in, because a nap on the couch might be what you want after you come home from the farmers market and a walk in the park. So for this particular Sunday, I’m not ashamed to say I chose to wear black sweatpants. Yep. That’s sweatpants. I like to think that being a little form-fitting and black makes them a little dressier. 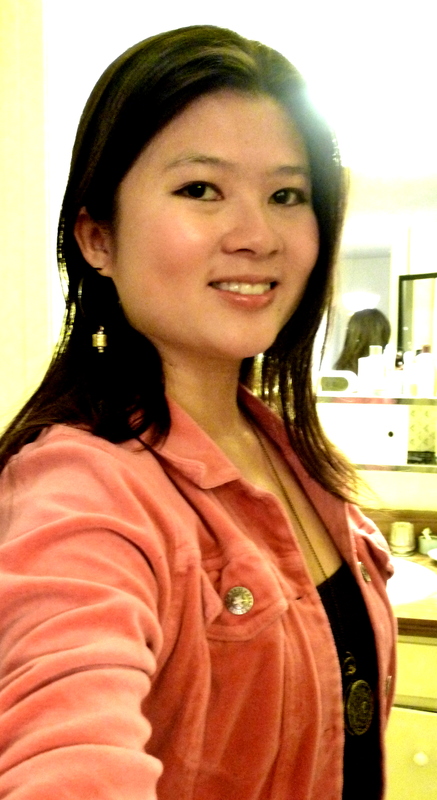 I wore a dark brown tank top and layered it with a bright salmon pink velour jacket. I’ve been lusting after Juicy Couture’s velour jackets for what feels like forever. I think they are just so soft and cuddly. But I cannot justify paying a hundred bucks for them. This particular one isn’t Juicy Couture, but it feels just as soft and I love the color. I found it in a consignment store for around $20. I like the bright pop of color it adds to the whole ensemble. I kept both jewelry and make up to a minimum. For jewelry, I wore simple hematite hoops with a pop of gold. 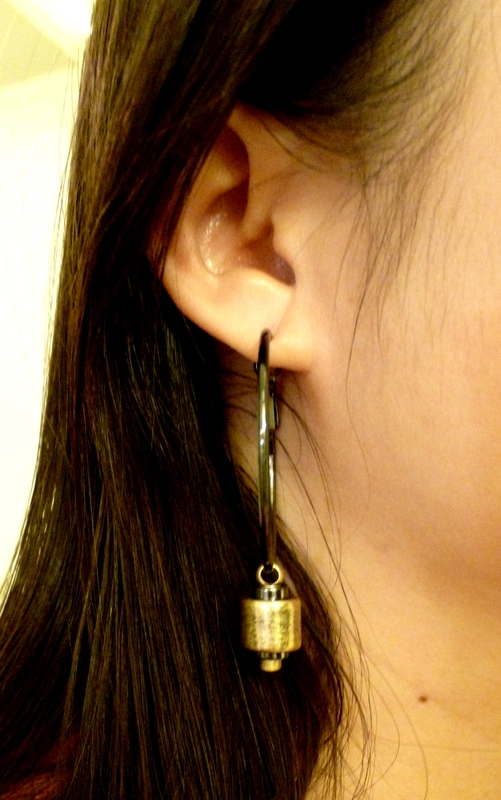 It’s Jewelmint’s Steampunk Earrings. Hoops always give me a gypsy feel, but this particular pair with the hematite and gears adds a layer of edginess, and the dark colors go with the earth tones of the outfit. I love the way the gold pops against all that dark, and matched it with a tarnished gold pocket watch I picked up in Japan. My watch is still in service, hence the need for a pocket watch. Make-up wise, I wore Jouer Luminizing Moisture Tint, and smudged Stila’s Smudgestick in Lionfish on my eyes. Topped it off rms lip2cheek in Modest, smoothed and blended on my cheekbones and lips, and that was it. And that’s my casual Sunday.